Back in March, I was interviewed by Viking magazine for a feature on Norse mythology in popular culture. 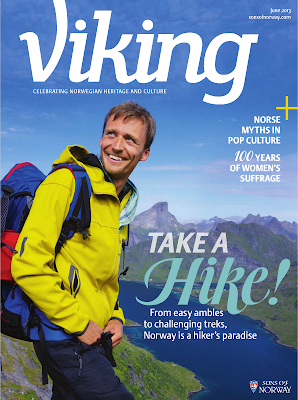 “Myths in the Modern Age” by Denise Logeland appears in the June 2013 issue of the magazine published by Sons of Norway. What follows is the complete text of my answers to Ms. Logeland’s questions on my approach to the Norse myths and what meaning they can hold for people in the 21st century. Dude on cover of June 2013 Viking magazine totally isn't me. 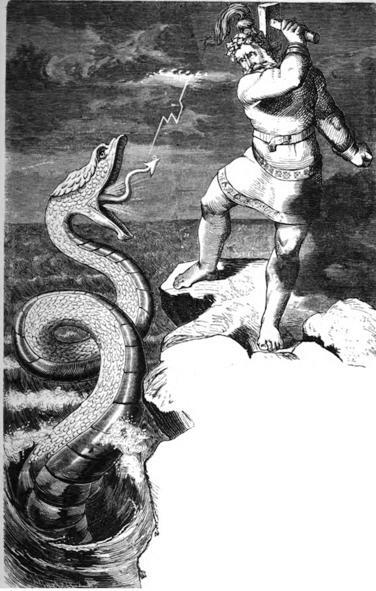 VM – When and why did you begin to study Norse mythology? What role and meaning has it had in your personal life? KS – I grew up with two philosophy professors for parents. As a kid during World War II, my father led his family out of anti-German death camps in Yugoslavia and into freedom in Austria. He was a monk before he left the Church to go into philosophy. My mother grew up in San Diego and was the first in her family to go to college. She was a nun before she left the Church to go into philosophy. You can imagine the conversations at the dinner table. When I was a kid, my parents had me read the Bible and the Greek myths. They told me that I could believe whatever I chose as an adult, but that I needed to know the Judeo-Christian and Greco-Roman traditions so I could understand our heritage of art, literature, music and philosophy. Growing up, I only knew the Norse myths from reading Marvel’s Thor comics. As a young German-American dual citizen (with Scottish and English mixed in), I believed that the Norse myths were really something just for Scandinavians. The age-old legends and tales of Nordic mythology are a common heritage of German, Scandinavian and Anglo-Saxon peoples. This was something I had never been taught in school. 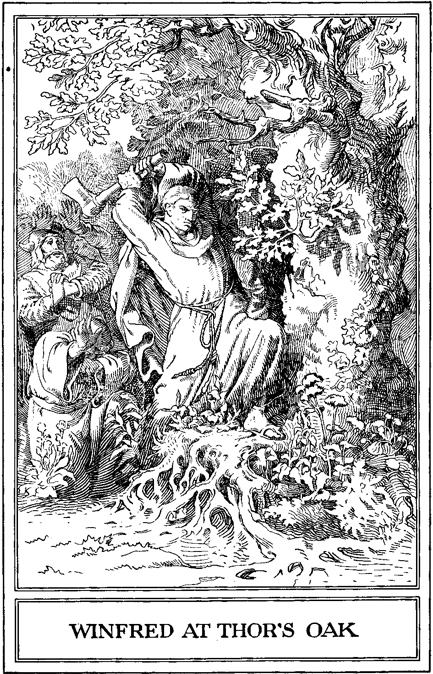 I had chosen to read the Nibelungenlied for a grade-school project, and I knew the German fairy tales and legends, but I hadn’t ever connected the Norse myths themselves with my own family background(s). 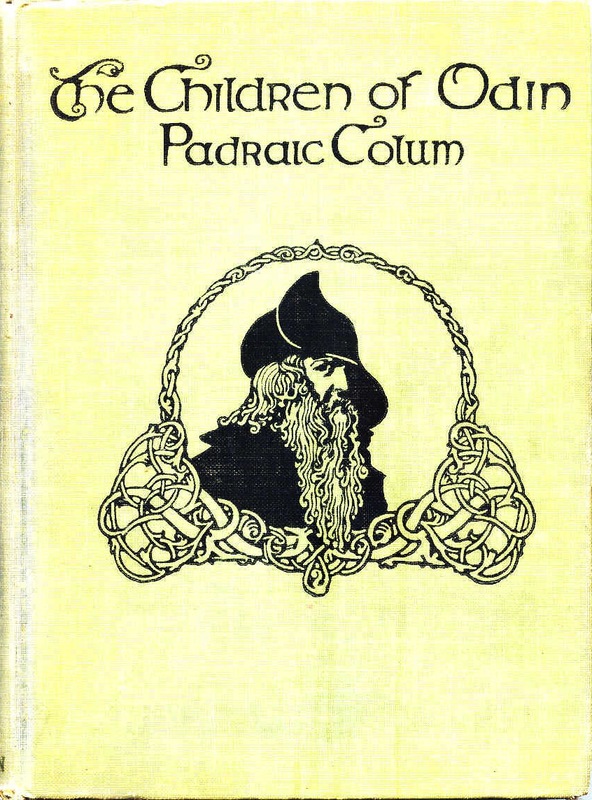 That blurb led me to read The Children of Odin, a retelling of the major Norse myths written by Irish poet Padraic Colum in 1920. I felt an immediate connection to the stories. Thor reminded me of my Opa, who had been a hard-working and open-hearted farmer back in the old country. Odin reminded me of my father, who dedicated his life to learning and questioning, seeking to understand and prevent a repeat of the inhuman horrors of the Second World War. I immediately started reading everything I could find on the Norse myths and the culture and history that surrounded them. The more I read, the more I came to realize that they really are the cultural heritage of the North. I tell my students that we may say Norse religion, but we really mean Pan-Germanic religion(s). The myths preserved for us by our Icelandic friends are the late flowering of a long and complicated tradition that took many forms and had many variations throughout a vast stretch of time and throughout the Germanic world – from continental Europe to the British Isles and throughout the Nordic countries. When I read the Poetic Edda, I was amazed by the worldview expressed in the poems – especially in Hávamál (“Sayings of the High One”), in which Odin speaks directly to the reader/listener. It really moved me to find out that – long, long ago – my ancestors had asked the same questions about their lives as I had about mine. How do we lead lives of worth? What meaning can we create in our lives? How do we treat others? What is the value of wisdom if it makes us more aware of our mortality? For me, Odin represents the endless search for knowledge – even if that knowledge doesn’t necessarily make you happier. Thor represents the inner strength to stand up to monsters. I don’t mean physical monsters like giants and trolls, but the monsters we deal with today: racism, sexism, homophobia and so on. There is much in the myths we can learn from and apply to our modern lives, if we read the myths poetically instead of literally. We are used to doing this with other religious texts like the Old and New Testaments. We simply need to see beyond the fantastic surface of the lore and seek to understand the deeper worldview that it expresses. Thor really doesn't get along with monsters. VM – What do we know about how the myths were told and used historically? Originally, who told them to whom, and why? When did they cease to be in wide circulation in the Nordic countries? When, how and why did their role change? 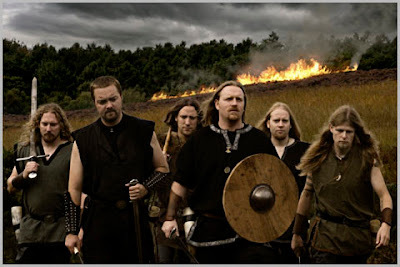 KS – The Norse myths that most people are familiar with really come from two Icelandic books from the 13th century – the Poetic Edda and the Edda. Strangely enough, they were both written down more than two centuries after Iceland’s conversion to Christianity. However, they contain our most coherent account of the mythology, based on much older oral traditions. Some of the myths have been connected to ancient poetry from Scandinavia, the British Isles and continental Europe. One of the things that makes Norse religion so different from other faiths is that its surviving texts were written down by people actually hostile to the faith. The Christians who created the surviving manuscripts belonged to a religion that had actively stamped out northern heathenry over the preceding centuries, sometimes in a very bloody fashion. Imagine if militant atheists had written the New Testament or the Chinese government was the only source of information about Tibetan Buddhism! "I'm here to chop down your sacred tree of Thor. 'em down & they can inspire future metal bands?" It’s really a miracle that we have the myths at all. We have to thank Snorri Sturluson and the anonymous compiler of the Poetic Edda for their pride in their cultural heritage, for having a sense of history that was strong enough for them to preserve the stories and legends of the older belief system. To the casual reader, the Norse myths can be enjoyed as fantastic tales of adventure. The more serious reader will, however, quickly realize that something much deeper is behind these stories. They are the cultural artifacts of a religious system, and much of that system is deeply embedded in the poetry and prose. Imagine if all that survived of the New Testament was stories of Jesus walking around performing miracles, with no context or religious meaning attached. You would simply have myths of a Jewish wizard, and you would miss the deep religious and spiritual meaning of his life and message. In order to really understand the Norse myths, we need to dive into archeology, history, comparative religion and a host of other disciplines. We need to read primary sources by writers from other cultures whose paths crossed that of the Norsemen – including Arab, English, Greek and Roman authors. 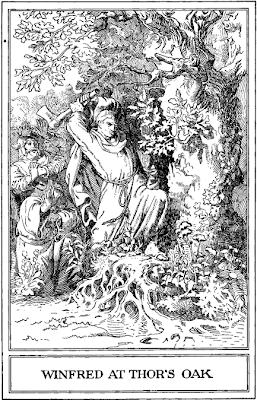 In the twentieth century, the French philologist Georges Dumézil teased out the meaning of some obscure Norse myths by cross-referencing them with religious texts from India and Iran – distant cousins on the tree of Indo-European religious traditions. As Christianity slowly took hold in Northern Europe, it would be expected that the Norse myths would die out as their root religion was forced out. Strangely enough, the myths never went away. Tales of the gods and heroes survived in folklore, in popular ballads, in fairy tales and in legends. In rural areas, the gods lived on in folk belief and superstition well into the twentieth century. 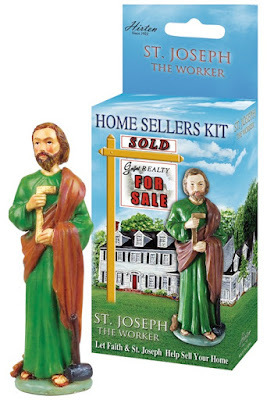 The older generation of my German family, when they came to America after the Second World War, brought practices with them that – while supposedly Catholic – had ancient roots in pre-Christian religion (like burying the statue of a saint in the yard and telling him he couldn’t come out until the house was sold for a good price). be packaged in a box and sold online. VM – I've come across a number of examples of Norse myths being referenced in contemporary culture. What are some examples that you're familiar with and find particularly interesting and significant? Why? 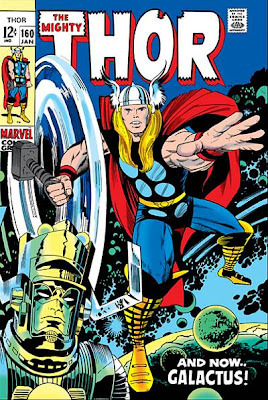 KS – I think it’s amazing that Stan Lee and Jack Kirby were both sons of Jewish immigrants, yet turned to Norse mythology to create one of the most recognizable icons of twentieth-century popular culture – the Mighty Thor of Marvel Comics. They used the ancient figures of Norse myth to tell very modern stories of life in America and even to work out issues related to the horrors of World War II. They mixed new ideas from the Space Age with the old mythology, creating a mixture of science fiction and myth that enabled the gods to walk down the streets of 1960s Manhattan. and fight supervillains from outer space? Over the decades, many brilliant writers and artists have worked with the Marvel version of the Norse myths, and some of them have taken the characters much closer to the ancient stories. I happen to love the comics, and I think that they continue to deal with contemporary issues in very interesting ways. How would Thor react to 9/11? What place does the World Tree have in the modern urban world? I’m also fascinated with the whole phenomenon of Viking Metal and Pagan Metal. There are many rock bands from Northern Europe and Scandinavia that focus exclusively on mythology, history and legend as the focus of their lyrics, album art and stage shows. They come from all over; Týr is from the Faroe Islands, Heidevolk is from Holland, Amon Amarth is from Sweden, Ensiferum is from Finland. Heidevolk's reaction to a club owner saying "I'll mail the check." Some of these groups blend the folk music traditions of their respective countries with modern metal music in very creative ways. Some use historical instruments side-by-side with standard rock instrumentation. Some use traditional lyrics and melodies and set them in modern fashion. Some provide extensive liner notes that explain the literary and historical sources for each song. Like the comics, this musical genre blends ancient and modern in very interesting ways. Sometimes, the lyrics make specific comment on contemporary culture and politics, but through the lens of an ancient worldview. Admittedly, a lot of it can be macho Viking posturing, but there is some serious thought at the heart of the best examples of this type of music. VM – What is it about the Norse myths that cause them to endure in the collective conscience and imagination? KS – Any great faith tradition has ancient tales and poetry that encode the questions and knowledge of ancient peoples. Norse religion is no different. There have always been people who have looked outside the Judeo-Christian tradition for insights into life’s mysteries. There is a power and vitality in the Norse myths that is very different from what you hear in church on Sundays. Among all the fantastic elements of Norse mythology, there is an earthiness and sense of realness that is very appealing. if you take the time to understand it. There are so many ways to read the Norse myths: allegorically, mystically, psychologically, religiously. There is no doctrine being foregrounded in the myths; the reader can bring her own interpretations to the stories. As a mythologist, I would hope that these interpretations would be built on a study of cultural context, but the magic of myth is that it can actually be read at so many different levels of engagement and knowledge. Also, there is something in Norse mythology for everyone. While a young person may be attracted to the strength and adventurous spirit of Thor, an older adult may feel a kinship with the melancholy wisdom-seeking of Odin. The appeal of the myths cuts across lines of gender and sexual orientation; the mystic glamour of Freya and the maternal strength of Frigg attract modern women and the sexual free-spiritedness of Loki speaks to members of the LGBT community. VM – Do the myths hold lessons for present-day readers? If so, what are those lessons? KS – Norse mythology holds many lessons for today’s readers, just like the texts of any great religious tradition. Much of the serious scholarship skips over this. Modern academics, for whatever reason, seem to be very uncomfortable drawing lessons from Norse mythology. They tend to lock the myths in the strongbox of the past, which really does leave them in the dustbin of history. I think that’s a terrible shame, since there is so much in the mythology that is meaningful to modern people. 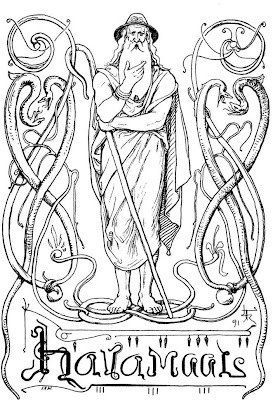 In Hávamál, Odin does not give commandments from on high, but provides aphorisms that serve as suggestions for leading a good life. He shares tales from his own experiences, providing examples of what led to failure and what led to success. This is very different from the rule-making patriarch of the Abrahamic tradition. 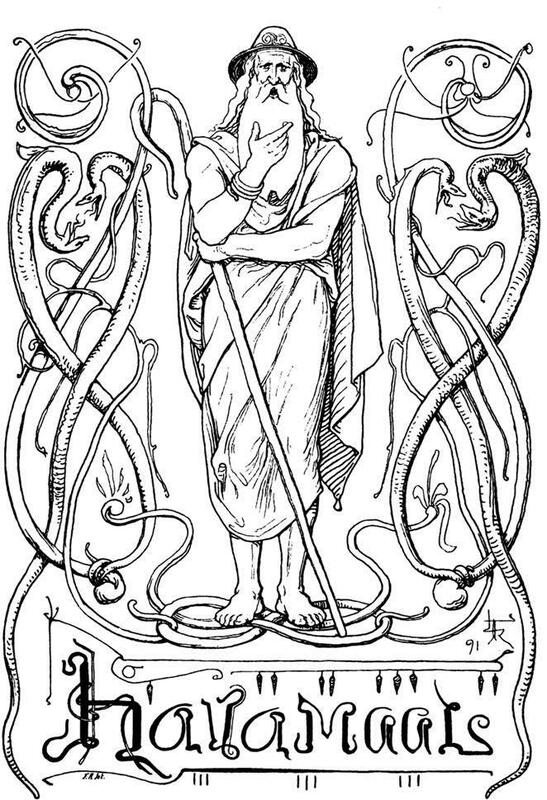 Odin stresses the importance of gaining wisdom, but fully acknowledges that knowledge does not always bring happiness. The more that he learns about the future, the more he becomes certain about the finality of death. The beauty of it all is that this does not lead to depression or fatalism, but rather to a fiercely burning passion to lead a life of action and accomplishment while raging against the dying of the light. if you simply take the time to listen. 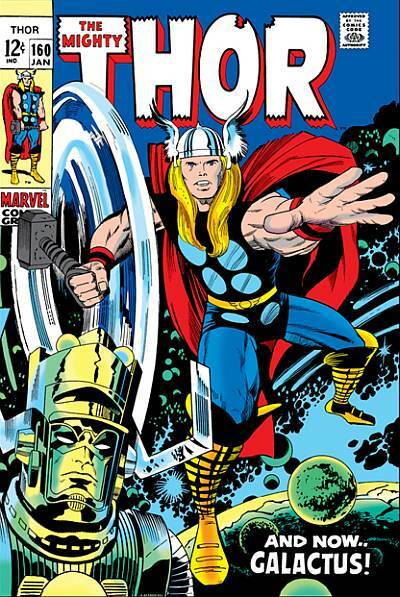 In many ways, Thor can be seen as an idealized self-image of the common man. He is completely honest, he prefers an open brawl to devious machinations, he is strong and hard-working, and he has a salt-of-the-earth wisdom that is very different from Odin’s studied cleverness. He is completely dedicated to protecting the world from the forces of darkness, and he has a very endearing lack of any sense of self-preservation – he simply leaps in and starts hitting things with his hammer. He is the god of the regular folk, the guy you’d love to have a beer with. The fundamental lesson of Thor is that all of us must stand up for what is right and fearlessly take on the “monsters” of our time. We must be brave enough to stand up against whatever form of monstrous injustice rears its head in our own experience. A big Viking “thank you” to Denise Logeland for asking such insightful questions! Interesting that, after several years, the Sons of Norway will no longer rent their campground in Alta CA to the Hammer of Thor Kindred for its twice-yearly gatherings. These are the biggest regular Heathen events on the West Coast. Reason? Hard to pin them down on this, but it smells like simple religious bigotry. These people like to remember their heritage, as long as nobody takes it seriously. 'He is completely dedicated to protecting the world from the forces of darkness' -- KS. What context do you use 'darkness'? I remember you objected against referring to the contest of Aesir v.s. Joten as a struggle of good v.s. evil, and I understand. It is strictly a struggle of Aesir v.s. Joten. That jotten spawn will swallow the sun and moon, provides the final darkness of the struggle gives an opportunity to use 'darkness'. Just wondering. Regards, Olaf Knute. This is a complicated (and fascinating) issue. 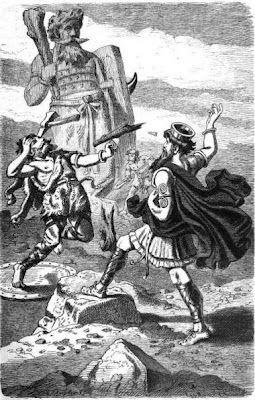 In the interactions between Odin and the giants, there is more of a sense of competition between tribes - without a "good vs evil" morality. Actually, in some stories, Odin comes across as less "moral" than his giant rivals. In these myths, the giants are simply a tribe of "outsiders" in competition with the Æsir. In the tales of Thor and the giants, however, the Thunderer is usually shown as protecting the everyone (gods and humans alike) from the giants. In these myths, the giants represent the destructive forces of nature. The myths do not resolve neatly into a dualistic worldview. Thor himself is sometimes terrifying in his rage. When a tornado destroys a town, is the tornado "evil"? I don't think that the Forces of Darkness have a moral tinge; they are simply destructive, and Thor is the one (we hope) will defend us from their rampages.